FILE - In this file image taken from video released Oct. 31, 2014, by Boko Haram, Abubakar Shekau, center, the leader of Nigeria's Islamic extremist group, speaks in an unidentified place. As Nigeria fights the brutal insurgency of Boko Haram, its army is hampered by an equally dangerous enemy: corruption. That is according to a new report by Transparency International (TI), a German-based non-governmental organization, which found that Nigerian military officers, politicians and other elites have enriched themselves by diverting money that was meant to fight terror. Much of this money is said to have disappeared through kickbacks, payments to "ghost soldiers" who don't exist, or via no-bid contracts resulting in inflated spending that benefits politically-connected contractors. Nigeria's vice president believes that $15 billion was lost on fraudulent arms procurement deals alone. "Corruption is worsening the conflict, and it's a big driver of insecurity in Nigeria," said Katherine Dixon, Transparency International's program director. "So, over the last 10 years, corrupt elites have profited from the conflict in the northeast and driven Nigeria to a crisis point." 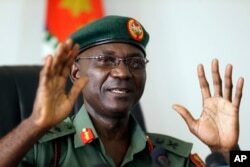 Nigeria's director of defense information, Major General John Enenche, told VOA's Daybreak Africa on Thursday that the report is false and unfortunate. Major General John Enenche speaks during a press conference at the defense headquarters in Abuja, Nigeria, May 18, 2017. "I would tell the whole world, since 2015, from when this new leadership took over, things have changed," he said. "So, I am suspecting that this kind of report is just meant to tarnish our image, demoralize our troops and discourage the international community that [is] helping us in our efforts to sustain the successes we are attaining in the northeast." Some of the corruption allegations mentioned in the report predate President Muhammadu Buhari, who made eradicating corruption a major campaign promise. The administration has taken action to fulfill its pledges, according to Dixon. "What the president has done is, he has set up these ad hoc committees to look into historic spending and has taken some steps to identify and prosecute individuals which have been involved in security sector corruption in the past," she said. A drop in oil prices has left corrupt officials in Nigeria scrambling for other ways to enrich themselves, according to TI's findings. Since defense makes up 20 percent of Nigeria's budget, it is an attractive target. Although military rule officially ended in Nigeria in 1999, TI says a small group of senior officers continue to control spending, and they, along with civilian enablers, enrich themselves through schemes like phantom contracts. In 2014, for instance, National Security Adviser Colonel Sambo Dasuki awarded a $500 million contract for refurbished helicopters to a company owned by a friend and financier of former President Goodluck Jonathan. The delivered helicopters were not suitable for combat and have never been deployed, TI reported. "For the price of each helicopter provided by this contract, the Air Force could have acquired seven top-grade, brand new military helicopters," an unnamed source cited in the report said. Dixon believes that it's ultimately the frontline troops who suffer from this kind of corruption. Under-equipped soldiers have been killed in ambushes or have simply fled the battlefield when faced with the superior firepower and equipment of the terror group. In 2015, 66 soldiers who had been sentenced to death for desertion had their sentences commuted when the court heard testimony that they did not have proper weapons or equipment. Other soldiers, supposedly on the front lines, don't exist at all. "Payments aren't made to the soldiers on the ground, and you end up finding lots of ghost soldiers in the ranks," Dixon said, referring to soldiers who exist only on paper to generate payments for commanders. TI found that the corruption also helps Boko Haram in its recruitment efforts. "If you've got an ill-disciplined security sector that is abusing its own power, whether it's because its soldiers are not being paid or because there's just [a] sort of a culture of impunity, then, of course, you are driving people to join groups like Boko Haram, who offer a very simplistic alternative to what is considered to be a corrupt establishment," Dixon said. TI recommends that the Nigerian military develops an anti-corruption strategy, provide public access to security information, regulate security votes and protect whistle-blowers. Dixon says that monitoring confidential procurement is also essential. "Some secretive spending will inevitably have to happen that should be overseen by a particular committee, so that you have proper monitoring that's confidential procurement," she said. "So any spending that is important enough to remain secret is important enough to monitor effectively."